this movie is the greatest movie, with excellent cinematic techniques. 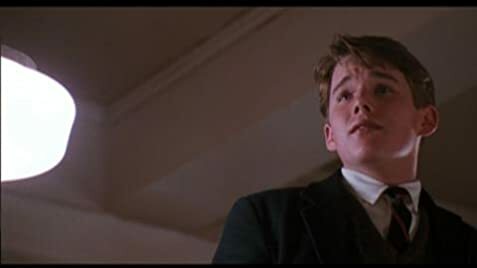 The film Dead Poets Society is a film that explores the idea of "Carpe Diem" (seize the day) from the viewpoint of a classroom of young men at an all boys boarding school. 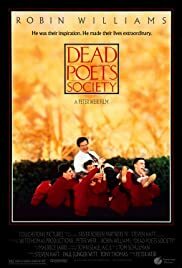 Their teacher Mr. Keating (played by Robin Williams)helps them stretch their minds, and exercise their right to defiant acts of love for life and poetry, rebuttlng society. The director Peter Weir treats you with eye candy by using various camera shots of beautiful scenary, and neat techniques. Weir takes you on a roller coaster that leaves you gripping your seat, enjoying life, and thinking "Carpe Diem" in your own life. There are some very depressing scenes, but they are very artful, and teach you of appreciation for those brave members of society that dare stand up for their beliefs, and rights to wrestling around with life. I thought Ethan Hawke (Todd Anderson) gave a true life twist to the film, Robin Williams (Mr. Keating or also known as Captain my captain) added an element of excitement, and Robert Sean Leonard (Neil Perry)added passion that leaves you mesmerized. I just saw this film in English class, but I immediatly fell in love with it, as I know you will. 149 of 199 people found this review helpful. Was this review helpful to you?